"There will be discussion over the next four years whether or not Hillary Clinton is fit to lead this country," he said at a Dallas event hosted by the conservative group Americans for Prosperity. "Is Hillary Clinton fit to be commander in chief?" The audience fired off a robust round of 'no's. The first-term senator went on to compare Benghazi to the 1993 mission in Mogadishu, Somalia, in which 18 U.S. military members were killed. Two months after the tragedy, President Bill Clinton announced the resignation of Les Aspin, then secretary of the defense. Aspin had taken heat for denying security requests for U.S. forces in the region just a month before the attack. "He ignored the request and he resigned ultimately in disgrace," Paul said. "I think had Hillary Clinton worked for Bill Clinton, she'd probably have been fired." 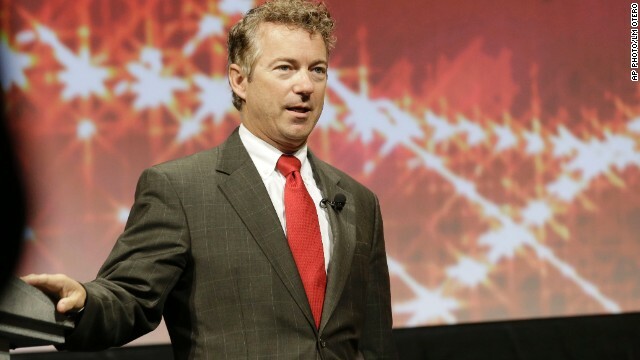 Paul has been hounding Clinton over foreign policy and Benghazi for the past year, and he frequently brings up the former secretary of state as he lays his own groundwork for a possible presidential campaign. In an interview earlier this summer, Clinton was asked about Paul's attacks, specifically about a separate claim he has made, saying Bill Clinton's affair with Monica Lewinsky could be a liability if Hillary Clinton runs for president. "He can talk about whatever he wants to talk about," Clinton responded. "And if he decides to run, he'll be fair game too." @tom I, your boy from KY us a flip flopper and a grist reread coward. When he was running for senator he allowed his goons to manhandle a woman. His trying to reach across the aisle is a mirage because he een from that Dreamer in Iowa faster than you can say 60s civil rights what the heck? There isn't a person who reads the Ticker who doesn't have tom I pegged for the troll that he is. The only surprise is that it has taken mods this long to grasp the reality. Tom I- Look dude, here it is- the article at hand is about Mr. Paul hypothesizing about a situation that didn't happen and won't ever happen and drawing a ludicrous conclusion- and worse, CNN calls this "News". See, when lying about their possible political opponents, using fiction like Paul is, completely negates any sane notion that Paul works across the aisle. He voted for the government shutdown (with hyper partisans McConnell and Cruz); voted against highway funding; voted against Bring Jobs Home Act; against Paycheck Fairness Act; Protecting Access to Medicare Act; against limiting student loan rates; against limits on firearm magazines, and limits on access to semi-automatic weapons; against Disaster Relief Funds 2013; Voted to keep Guantanamo open .... and more. Look- he is a dyed in the wool hard line conservative who votes nearly continuously with McConnell. The idea this Ayn Rand wannabe isn't someone who "reaches across the aisle" any more often than a Sunday blue moon. 13 embassies attacked under BUSH and no Committees were formed to look into why this happened. The GOP should be ashamed of themselves the way they are going about this! I can understand why a wealthy American would vote for a Republican. I can also understand why someone with an agenda such as gun owner rights might vote for a Republican. What puzzles me is the fact that so many poor and middle income Americans would vote for the same people who keep them down by catering to the rich.